At the recent Festival of Media Global, Pepsico executive vice-president and chief marketing officer Salman Amin declared that television is here to stay. Television continues to be a significant production investment for advertisers, be that broadcast or online and traditional advertising 30 second spots or longer form television programming, webisodes and documentaries. Therefore television production costs and management continue to be a significant issue for many advertisers. TrinityP3 have been providing marketers and advertisers with television production benchmarking, management and advice since we commenced in January 2000. 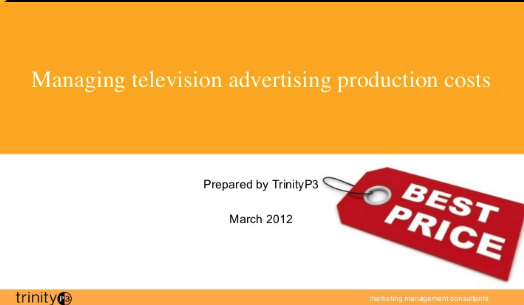 We prepared this presentation to provide marketers and advertisers with an overview of the various approaches for managing television advertising production more cost effectively. Has complex and technical language that can make the process mysterious and confusing. Is still often the second largest, single advertising expenditure after media. Costs have remained relatively stable at a time when increased media fragmentation is causing a shift in the productive to non-productive ratio. There are literally hundreds of production cost variables making it difficult to apply a realistic net benchmark for bespoke productions. The base cost of production is directly related to the level of complexity of the concept being produced. There are many subjective production variables that can add cost to the production without necessarily adding to the effectiveness. Film and production company estimates are often long, detailed and confusing, making assessment difficult while agency estimates often provide no significant insight or transparency in their brevity. There are an increasing number of production options, beyond television commercials, becoming increasingly popular and requiring different skill sets and approaches, such as long form documentaries, programs and films for the internet and broadcast. Careful uncoupling of parts of the production process from the agency can achieve savings due to economies of scales. Deadlines will often mean that proper cost negotiations, due diligence and risk reduction are overlooked by the agency. Production technology can be applied to reduce cost or add cost depending on the desired production outcomes. The film production process is universal, however there are local market variables in government legislation and industry practices that can add cost or provide savings. Cost management – cost consultants and production managers. 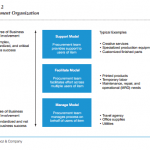 Supplier management – uncoupling and pricing. The mix and type of productions. The range of suppliers currently used. The consistency and stability of the requirement. The choice of outsourcing these capabilities or recruiting these into the organization depends on the volume of productions and level of investment. What type of production management system or process do you use? And how effective is it in ensuring the best possible value? Let me know by leaving a comment here.